Virginia Board of Physical Therapy 15.5 (Type 1)–Please check with your state board for approval as most physical therapy boards will reciprocate approval for continuing education. The American Academy of Health and Fitness (BOC AP#: P3645) is approved by the Board of Certification, Inc. to provide continuing education to Certified Athletic Trainers. This program is eligible for a maximum of 15.5 Category A hours/CEUs. The Cancer Exercise Certificate Program was developed for health and fitness professionals seeking to attain a higher level of mastery and work with cancer patients during and after cancer surgery and treatment and into survivorship. Participants will gain a complete understanding of the entire cancer process from diagnosis and treatment to reconstruction and survivorship. The program’s unique and individualized programming will help to improve the patient’s ability to cope with the mental and physical stress following cancer diagnosis and treatment. It takes a special person, both empathetic and compassionate, to work with cancer patients. One must have a deep understanding of exercise oncology and how to safely and effectively create an exercise program with proper modifications and progressions. The Cancer Exercise Certificate Program will give you the tools and confidence that you need to work safely and effectively with cancer patients and survivors at all stages of the recovery journey. The Cancer Exercise Certificate Program is a comprehensive continuing education home study course offered to you in a distance-learning format covers 25 types of cancer, as well as pediatrics, with special emphasis on breast cancer and breast reconstruction. The Cancer Exercise Training Institute has trained more health and fitness professionals worldwide in the area of cancer and exercise than any other organization. Andrea Leonard, 33-year cancer survivor, author of “Essential Exercises for Breast Cancer Survivors,” NASM Corrective Exercise Specialist and Performance Enhancement Specialist, and President/Founder of the Cancer Exercise Training Institute began her extensive research in 1995; long before anyone had ever heard of “cancer exercise.” She spent three years working on Essential Exercises with the chiefs of breast surgery at Georgetown, George Washington, and Johns’ Hopkins University Hospital Medical Centers. Realizing there was a need to assist patients with many types of cancer, Andrea expanded her research and writing to cover a broader spectrum. She is truly a pioneer in the field of cancer and exercise and has paved the way for other organizations to follow. 1. Demonstrate an understanding of the diagnosis and treatment of cancer. 2. Demonstrate an understanding of the different surgeries, including reconstructive, and the impact of these surgeries on physical mobility, posture, and activities of daily living. 3. Understand the signs and symptoms of upper and lower extremity lymphedema and how to prevent and manage them. 4. Perform a full-body postural assessment and range of motion assessment. 5. Develop a comprehensive therapeutic exercise program to help correct muscle imbalance and range of motion limitations while addressing other acute and chronic treatment side-effects. 6. Develop sensible periodization principles based on the patient/survivors age, fitness level, reaction to treatment and/or length of survivorship. 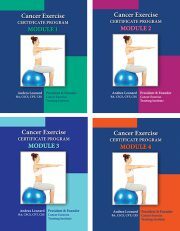 Electronic format — The Cancer Exercise Certificate Program package with online test is divided into four modules each with a handbook in PDF format and accompanying video. Instructions for completing the 100-question multiple-choice online final test and obtaining CECs are also included in PDF format. Note: This course package is made available for immediate access and download after purchase. All materials for this electronic format course are available electronically. Nothing is mailed. Get an in-depth look at the most common surgical procedures for 25 of the most common cancer types, as well as pediatrics. Experience a video-based session, as well as a comprehensive manual, on the subject matter.